Island-hopping: From Newfoundland to Hawaii! I opened the first package and pulled out a small, glossy book – its cover graced with photos of some very exotic looking birds. I flipped through the pages, reading about birds I have only dreamt about seeing and with names I struggle to pronounce: ‘Akiapola’au; Maui ‘Alauahio; Puaiohi; Kauai ‘Elepaio. The second package, from my friend Jody Allair in Ontario, contained a set of CDs loaded down with the beautiful voices of these equally stunning birds. And the third package, from British Columbia, included a list of the twelve participants from across the world who will be joining Jody and I on the upcoming Eagle Eye Tours trip to Hawaii !! 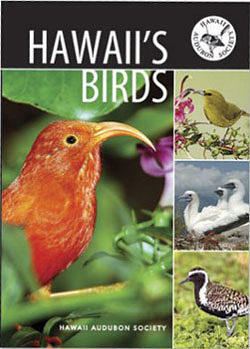 This pocket-sized book is fantastic publication of the Hawaii Audubon Society, and provides a great introduction to the birds and avian ecology of the fabled archipelago. The natural history of Hawaii is itself an intriguing story – a chain of volcanic islands spewed forth from the ocean and developing its own unique ecology over millions of years. It is home to dozens of endemic bird species, including the bizarre and beautiful honeycreepers – some of which occur on only one island. The evolution of these birds, from just one or two ancient ancestors into an array of species highly specialized to their own niche, is considered by some to be an even better example of adaptive radiation than Darwin’s famous Galapagos finches! But the story of Hawaii’s amazing birds is a bittersweet one, illustrating one of the saddest environmental disasters of all time. Following the arrival of humans (first Polynesians, then Europeans) the introduction of foreign predators, avian diseases and competitive species (bird and mammal) has led to a rapid decline and extinction of the islands’ native birds. In fact, of the 109 species of bird known to have been endemic to Hawaii, all but 37 have already disappeared!! And 33 of those remaining are on the U.S. endangered list, clinging to continued existence under the massive pressure of human interference. In fact, Hawaii is considered to have the highest number of endangered species per square kilometre in the world!! 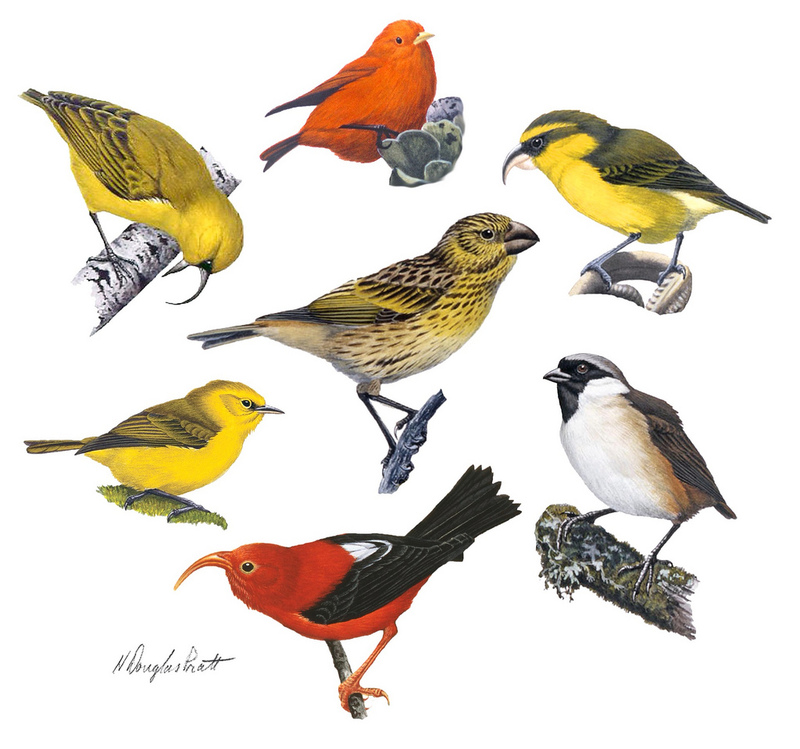 This illustration, from a recent cover of the journal Current Biology (November 2011) shows a selection of the very unique and specialized honeycreepers that evolved on and are/were endemic to the Hawaiian archipelago. I am, without a doubt, looking forward to our visit and to sharing this amazing place and incredible birds with a group from all over North America and Japan – but I also expect it to be eye-opening to the fragility of nature and the perils of introduced species. Expect a bunch of blog posts about my experiences when I get back! This entry was posted in Uncategorized and tagged Endangered species, Hawaii, Species at risk, Tours. Bookmark the permalink.